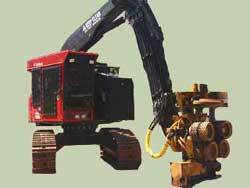 Logging Equipment is Our Business! Working in conjunction with Hahn Machinery of Two Harbors, MN, Forestry Equipment Sales offers classified advertising & low cost brokerage services to assist logging companies, and others to sell their excess logging equipment. We offer full-scale internet marketing of used logging equipment of all types including delimbers, processors, harvesters, forwarders, skidd ers, feller-bunchers, loaders, slashers, graders, dozers, excavators, trucks and anything else that could be found on the logging job! Forestry Equipment Sales offers a means for logging companies to sell their surplus equipment throughout North America without the hassles and expense of advertising and selling the equipment themselves. For those that prefer to sell their equipment themselves, we now offer logging equipment classifieds. For a very reasonable rate, logging equipment dealers and loggers who are looking to sell used logging equipment can sell it at Forestry Equipment Sales.com. Logging companies looking to buy good, used, reasonably priced logging machinery will find Forestry Equipment Sales a valuable source for the equipment they need. Thanks for visiting our website... we hope you find it a valuable tool for buying or selling forestry equipment around the world.